UNICEF and the Global Goals campaign have launched the World’s Largest Lesson, an initiative to teach children in more than 100 countries about the new Sustainable Development Goals that will be adopted by the UN General Assembly later this month. “Young people can help achieve the global goals by holding their leaders accountable for the promises they are making – and by holding themselves accountable for building a better future for everyone,” he added. UNICEF announced that the initiative has already attracted support from influential leaders and public figures including Queen Rania Al Abdullah of Jordan, Lebanese singer Nancy Ajram, tennis star Serena Williams and the Brazilian footballer Neymar. In addition, Government leaders from a number of countries will be teaching and participating in lessons. The UN estimates that a potential 500 million girls and boys between the ages of 8 and 14 will have the chance to learn about the Global Goals. These range from ending extreme poverty, to tackling climate change, and giving all children the opportunity to gain a quality education. “By making the Global Goals famous we can give them the best chance of working around the world – and help make us the first generation to end extreme poverty, the most determined generation in history to end injustice and inequality, and the last generation to be threatened by climate change,” explained Richard Curtis, filmmaker and founder of the Global Goals campaign. 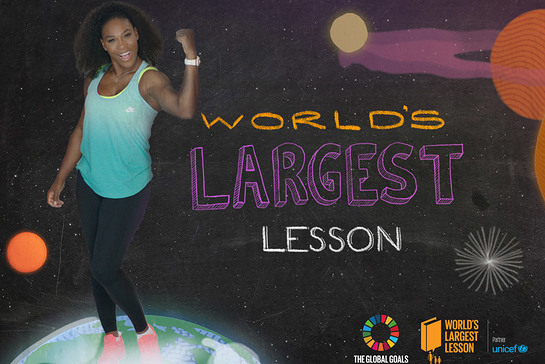 The World’s Largest Lesson will be held in classrooms on every continent during the week of 28 September. As part of the campaign specially created lesson materials include an animated film by Aardman and author and education expert Sir Ken Robinson that introduces the Global Goals, and a downloadable comic book by Josh Elder, Karl Kesel and Grace Allison.